A long term 5:2 intermittent faster's experience. An experienced 5:2 Fast Dieter's tips, thoughts, meals and weight loss story. Wondering if the 5:2 Diet lives up to all the hype? Read on! The husband of a friend of mine is a chef at an Indian restaurant and some years ago we did a recipe exchange – I showed him how to make my awesome chocolate fudge cake so he could serve it for dessert in the restaurant and he taught me how to make my favourite dish from his menu. 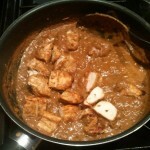 The recipe involves preparing two bases for the curry and then the cooking stage. You’ll probably want to prep this ahead of time as it takes a while – but is well worth it! Roughly chop the onions (I tend to chop them in half, then each half into quarters) and put them in a saucepan. Cover the onions with boiling water and add the good pinch of salt. Optional: If having this on a non fast day, or if you’ve got enough calories to spare, you might like to add a little splash of oil to this mixture or a teaspoon of curry powder. It’s not essential though and the recipe works well without. Put a lid on the pan and heat gently for around 30-45 minutes until the onions are well softened and there’s not lots of water left (remember to check on them regularly, you don’t want them to dry out). Remove the mix from the heat, remove the lid & allow to cool. 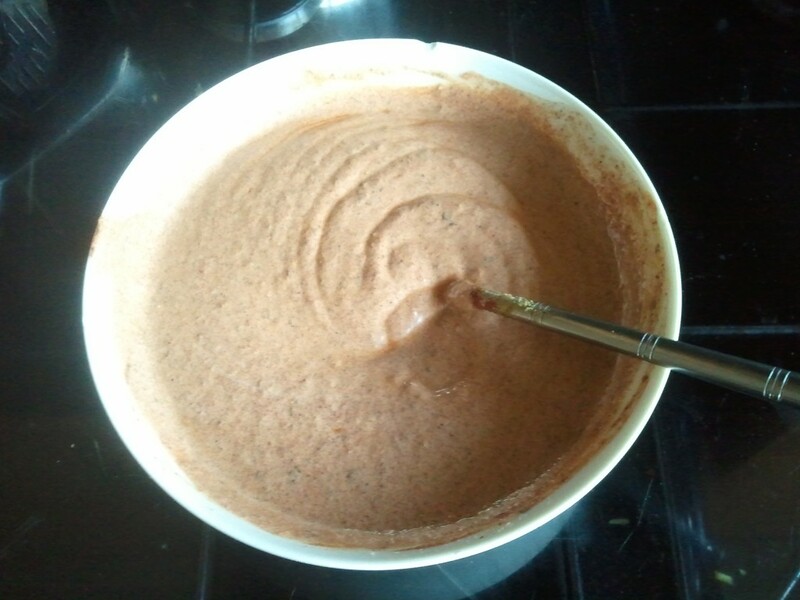 When the mixture is cool, use a blender to blitz the mix to a fairly thick, oniony mush. 1tbsp mint sauce (13kcal) – yes, I do mean like the jars of mint sauce you use with a lamb roast! 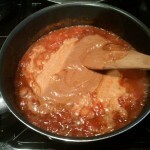 Measure the natural yogurt into a bowl and add the various sauces and pastes, stirring well. In a pestle & mortar, grind the garlic and ginger into a paste. If you do not have fresh garlic and/or ginger you can substitute with a couple of teaspoons granules/powdered forms of each instead. Mix around two thirds of the garlic & ginger paste into the yogurt spice base. Leave this mix to stand a little while as the flavours will start to infuse in the yogurt. *I always recommend using full fat yogurt as the fat is what helps bring out the curry flavour. If you prefer to use low fat please make sure it’s not one with added sugar and other nasties. There are low fat yogurts out there with no additives which are much better for you! A greek yogurt may give you a thicker creamier curry whereas a tangy natural yogurt will give an added zing to the flavour. Experiment and see what you like best! Right, now your onion gravy is prepared, your curry sauce base has stood for a little while and now you’re ready to start cooking! Chop the onion to whatever size/shape you prefer the pieces to be in your curry. I like mine quite chunky! 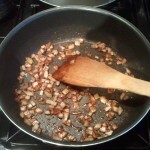 Heat the oil in a frying pan and add the onion and ground mixed spice, stirring well. 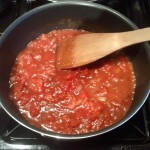 Next add the tin of chopped tomatoes and continue to fry this as it absorbs the spices. 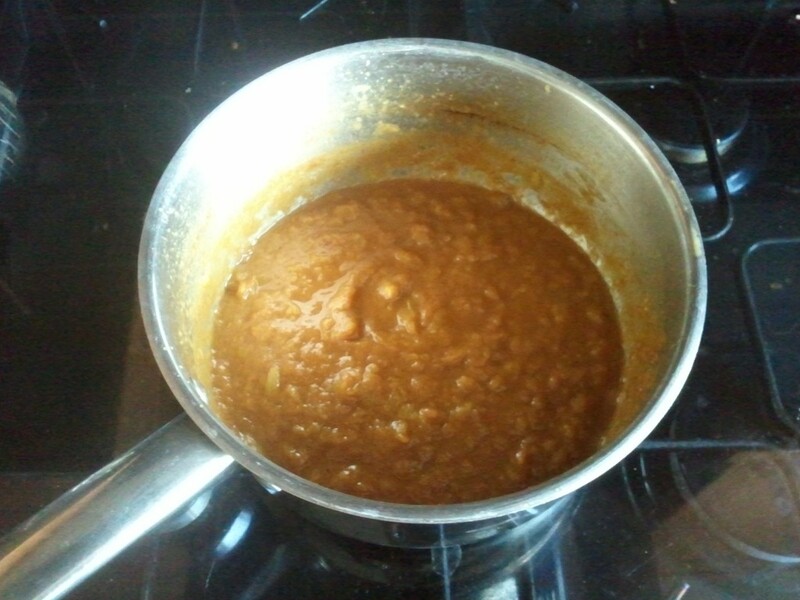 Add the remaining garlic/ginger mix you prepared when making the curry sauce base. Add the onion gravy base and stir well. Add the curry sauce base and stir well. Add the sugar and fenugreek leaves and stir well. Continue to cook the sauce gently until it reaches your preferred consistency, adding the chopped coriander right at the end. Tikka or Tandoori Chicken cooked on skewers adds a real takeaway feel to this dish! Now you’ll want to add any meat or vegetables you may have prepared to complete the dish. For a fast day I will measure out the portions of sauce first and then add the meat. 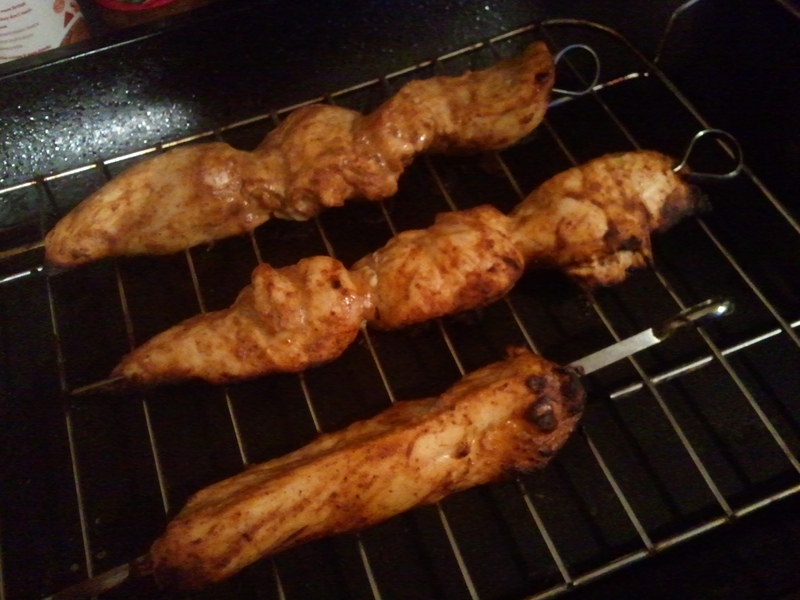 I normally use chicken, prepared in the oven on skewers, around 100g of chicken (a small breast) per person should be enough. I slice the breast down the middle lengthways, mix all the chunky strips of meat with a little tikka paste or tandoori paste and then put them on skewers in the oven for around 20-25 minutes. You can leave out the paste on a fast day, it’s not essential, although it doesn’t add many calories when spread around all the portions of chicken. On removing the chicken from the skewers I chop each sliver into 3-4 pieces so it looks like the meat from a curry house – it’s got the colouration on the outside, the right shape and even the hole in the middle! So, we’ve got around 166kcal of sauce with 114kcal of chicken for a total of 280kcal. That leaves you with 220kcal for a side dish – you might want to have some kind of rice (boil with a little turmeric & cinnamon, maybe add some peas!) for that authentic Indian meal, some Indian style cauliflower rice for a low calorie low carb alternative or maybe you just want to mix in lots of tasty veg (spinach is great!) or whip up some simple saag aloo by boiling a calorie counted portion of potatoes in turmeric and gently frying off with some spinach. I’ve got an awesome bombay aloo recipe but it’s not really fast day friendly. I’ll see if I can adapt it one of these days! Once you’ve got the basics of making a curry in these three stages it’s easy to mix and match your ingredients to make experimental curries – a little more of this, a little less of that, maybe try using a different flavoured oil or putting some chilli powder in with the onion gravy when you cook it. The possibilities are endless and mostly fall within the same sort of calorie range. No More Elephants in the Room – 5:2 Fast Dieters lose over 10 tonnes! 5:2 Summer Treats for in the Heat! Top tips for 5:2 diet newbies & first time fasters! How do I do the 5:2 diet / The Fast Diet? What should I eat on my feed days? What is TDEE? What should/can I eat and drink on my fasting days? How much weight can I expect to lose on the 5:2 diet/The Fast Diet? This site is provided as a reference for people who are trying the 5:2 intermittent fasting lifestyle/diet. It is in no way associated or affiliated with The Fast Diet official website, Dr Michael Mosley or Mimi Spencer. The author is not qualified to give medical advice and cannot be held responsible for any advice or suggestions you choose to follow. The information on this website represents the views, opinions and findings of the author. Please always consult your medical practitioner where health issues are concerned. The content of this site is not to be copied, redistributed or published in any way without the express permission of the site owner and/or relevant content authors and should in all cases be credited with a reference or link to this website.